A Wall Section includes one Basic Upright with Cap, one Base Shelf, one Kickplate, one Back Panel and one Top, Center, and Lower Spanner. If the Gondola is 78" tall or taller, the section would also include one Splicer Spanner. A Gondola Section includes one Basic Upright with Cap, two Base Shelves, two Kickplates, two Back Panels and one Top, Center, and Lower Spanner. If the Gondola is 78" tall or taller, the section would also include one Splicer Spanner for two piece backs. Available in 3' and 4' widths, 8" to 30" depths, two and 3 position in either a flat position, 15 degree or 30 degree down slope. The solution for maintaining separation of school, office and art supplies. Dividers are 3 3/4" wide x 7 3/4" high x 6 3/4" deep. The dividers clip into front shelf perforations. Minimum product width is 6". End dividers are sold separately and in pairs. Heavy gauge steel wire construction, powder coated for long life and extra wear constructed for Potato Chips in a Grocery Store, Candy, Bed Linen, and more. 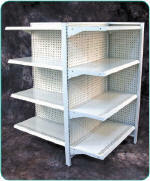 Many different shelf styles for all types of products available for most applications and store specialties. The best way to configure an End Cap is with a double back single sided gondola shelving unit that would sit flush up against the Gondola Shelving Unit creating an even stronger more sturdy and affordable. How Difficult is Shelf Installation? Click the link above for a detailed installation movie that shows you how to install your new display shelving. EZ to install wooden canopy sections for any wall or gondola aisle sections available with lighting fixtures available. This versatile fixture gives maximum exposure to impulse items. 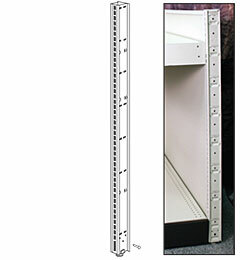 Panel frames are slotted to accept all Madix Standard Shelves or accessories. The Laminated or Carpeted Deck is 5" high, plus the deck has 'T' mold edge to match kickplate. Many standard and optional colors to choose from: Sahara, Chocolate, Gray, White, Black, and more. Gondola shelving is a great way to display all types of items such as boxed items like soaps, paper items like toilet paper and paper towels, jarred items like jelly, peanut butter, canned goods like bulk soda, bagged items like chips, and small items that can be hung on a peg hook. Display shelving works well in all types of stores like convenience stores, beauty supply stores, grocery stores, party supply stores, smoke shops, hobby shops, and more. Display shelving can be delivered through many warehouses located in all parts of the country. Gondola Countertops are assembled using an existing Gondola Island shelf section with a countertop and Gondola counter brackets. Wood construction with top surface and edgework finished in choice of laminates. Available in widths from 8" to 48" and lengths. Hypermaxi rack systems add extra storage to any wall or gondola island shelving aisles.